Certification by Kiwa: equipped for the future. Like every good business, you guarantee the quality you deliver. After all, your products, services, personnel and processes comply with all the laws and regulations concerning safety, efficiency, control and sustainability. These values all come naturally to you. But convincing potential customers or clients of your good intentions matters, too. Kiwa's certification services can help you do just that. Our certificates and reports offer reliable, objective and internationally recognised evidence that you comply with all quality norms. Moreover, they provide your organisation with a lasting quality incentive. Certification can be a useful tool to add credibility, by demonstrating that your product, service, (management) system or employees meet the expectations of your customers. In some cases, certification can even be required by law or contract. We can help you make your company's quality values visible to the world and support you in making a positive difference in your (international) market. Government institutions recognise Kiwa certificates and reports as reliable proof that you comply with European laws and regulations. Kiwa's services extend beyond simply issuing certificates. At your request, Kiwa - in co-operation with independent experts - can also carry out inspections and research in the fields of risk management, environmental legislation, the working environment and safety issues concerning your products and services. Our combined knowledge of laws and regulations and of technology will ensure you of an impartial and thoroughly grounded evaluation that will exceed both your expectations and the required norm. 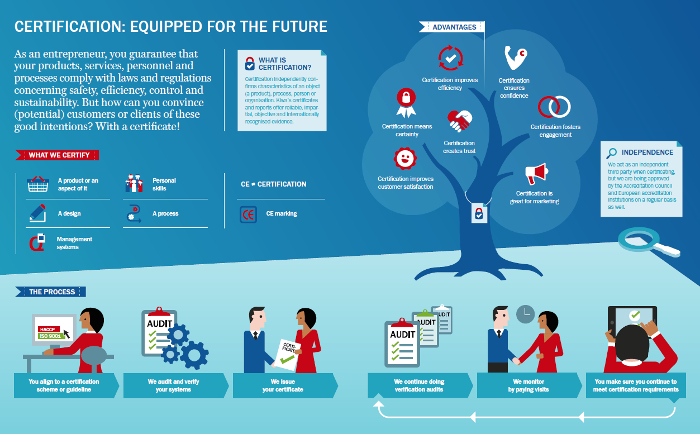 You can be sure that with Kiwa's input, your organisation will be equipped for the future. Determine whether or not a company has a valid certificate for a certain standard or certification scheme through the Kiwa certificate search (redirects to the Dutch Kiwa website). You have decided that you want your product, process, service, (management) system or person(s) to be certified according to a certain certification scheme. (Not sure yet? Here are the advantages of certification.) Kiwa helps you from start - aligning your company - to finish - handing you your certificate. But before that, there are a few steps to take. In order to be certified, it is vital to align your company or organisation to a certain certification guideline. We can help you with that by performing an initial audit or certification test on your product. Such a step can give you helpful insights into whether your product, process or system meets all requirements. All requirements, regulations and laws that apply to a product, process or (management) system that you want certifying are described in some kind of guideline. Such a guideline has been independently drawn up by a Board of Experts, often representing all parties involved in a certain market sector or profession, such as clients, manufacturers, suppliers, consultants and authorities. The guideline forms the basis for certification. The Board of Experts also determines the qualifications for auditors and inspectors (who assess what has been laid down in the guideline) and sets the frequency and request for audits. Once you are ready to have your product, process, service or (management) system certified, a Kiwa auditor will audit it. He or she represents us as the independent third party (alongside yourself and those who have drawn up the guideline). If the audit shows that the item to be certified item meets all requirements, you will receive the certificate and our certification quality mark (if applicable). If any defects are found, you will get at least six months to implement improvement measures. After initial certification, a Kiwa auditor will regularly pay (announced and unannounced) visits to your company to see whether the product, process or system still meets the requirements and still warrants the certificate. As the certificate holder, you have the right to use a quality mark, but you are obliged to observe the applicable requirements. If any anomalies are found, we may impose sanctions. Our high-quality certification activities have their price. How much you pay, depends on the complexity and size of your organisation, the number of locations or subsidiaries involved and the nature of the certification. Naturally, Kiwa will always provide you with an estimate of the time and cost involved prior to starting the procedure. Usually, you can earn these costs back rapidly for the simple reason that an independent quality label increases your market chances. Just to close the loop: we act as an independent third party when certificating, but we, too, are approved on a regular basis ourselves. The vast majority of systems, products, processes and certification of person regulations have been accredited by the Accreditation Council and European accreditation institutions. What is first, second and third-party certification?